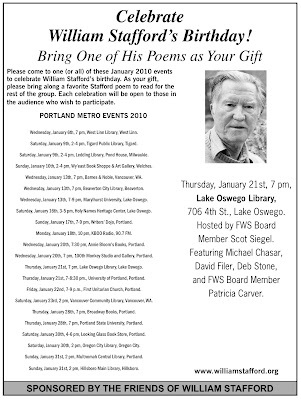 During January of 2010, more than 40 events across the United States—and 22 in the Portland area alone— commem- orated the birthday of poet and longtime Lake Oswego resident William Stafford (January 17, 1914-August 28, 1993). Organized primarily by various Friends of William Stafford, these events featured poetry readings, lectures, recollections and—in Lake Oswego, at least, where Poetry & Popular Culture was invited to take part in the fun emceed by Oregon poet and urban planner Scot Siegel—carrot cake and punch. We are always, as the poet Barrett Watten has said in his book Bad History, living in "the era between two wars," and so the evergreen poem, "The War Season," is always timely. Whether it's 1945, 1948, or 2010, it's always War Season, and the fact that Stafford's verse could have been perfectly relevant during the war, after the war in the "era between two wars," or today, is "The War Season"'s sadness, tragedy, and, ultimately, the moral and ethical critique the poem is after. Stafford, the Conscientious Objector, knew—feared, protested—the fact that it's always War Season. And so the date that he wrote on his manuscript copy of "The War Season"—the date that threw librarians, archivists, and myself off track—is not only not wrong, but perhaps not right enough, as it could have been published in The Oregonian "in about 2010" as well. This is one of the reasons—an unfortunate reason, yes, but one nonetheless—why Stafford stays relevant to us today. 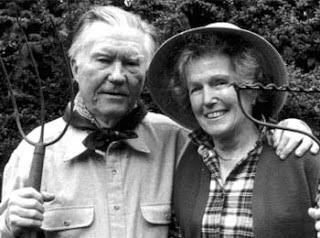 For more on Stafford, check out the William Stafford Archives at Lewis and Clark College. See you around the punch bowl in 2011?